: Steve Dubin, a spokesperson for the Plymouth Turkey Trot and Thanksgiving Day Pilgrim 5k Run and Walk, poses in front of the National Monument to the Forefathers. At 81 feet high, it is thought to be the world’s largest solid granite monument, and is one stop along the five mile Plymouth Turkey Trot, which takes place on Thanksgiving morning starting at Plymouth Rock. Think Plymouth and what comes to mind? Thanksgiving, sure. Plymouth rock, of course. The Mayflower and Plimouth Plantation, no doubt. Yet perhaps the most important monument in town, the Forefathers Monument on Allerton Street, barely gets a sniff from visitors. On Thanksgiving Day that will change as several hundred runners participating in the Plymouth Turkey Trot will circle the National Monument to the Forefathers as part of the five-mile course. 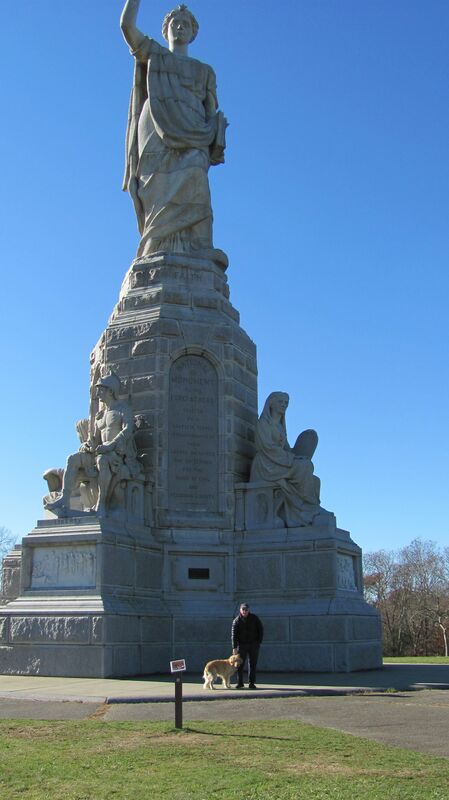 Formerly known as Pilgrim Monument, the National Monument to the Forefathers commemorates the Mayflower Pilgrims. Dedicated on August 1, 1889, it honors their ideals as later generally embraced by the United States. At 81 feet high, it is thought to be the world’s largest solid granite monument, and is the third tallest statue in the United States. The second annual Plymouth Turkey Trot starts at Memorial Park at Plymouth Rock at 7:45am. The five-mile course offers scenic views of the Plymouth’s picturesque oceanfront, and passes several historical sites including the aforementioned National Monument to the Forefathers, as well as Plymouth Rock, Burial Hill and The Mayflower. The cost to register is $27. Prizes will be awarded to men’s and women’s winners in several age groups. The fourth annual Thanksgiving Day Pilgrim 5k Run and Walk kicks off from the Village Racquet and Fitness Center, at Pine Hills, 30 Gold Drive, Plymouth at 10:15 a.m. rain or shine, also on Thanksgiving morning. The course includes the oldest road in America, Old Sandwich Road. This race site was the original trail used by Pilgrims and Native Americans in the 1600’s as they traveled from Plymouth to Sandwich, Mass. Cost is $27. The 2013 Second Helping Challenge welcomes runners to sign up for both races at a reduced rate of $40. Running both races earns runners a permanent listing on the Second Helping’s “Couch of Fame and on Plymouth Rock Racing’s Facebook as well as an exclusive and awesome Second Helping sweatshirt. The top three combined time winners for both men’s and women’s divisions will receive a cool prize and trophy. Prizes will also be awarded to top Second Helping participants in the following age groups: 15 and under, 16-19, 20-29, 30-39, 40-49, 50-59 and 60 and over. For complete race information and registration details on the Plymouth Turkey Trot, Thanksgiving Day 5k and the Second Helping Challenge visit www.plymouthturkeytrot.com. If you or your company is interested in sponsoring either the Plymouth Turkey Trot or the Thanksgiving Day Turkey 5k, please contact Steve Dubin at 781-582-1061 or sdubin@prworkzone.com.